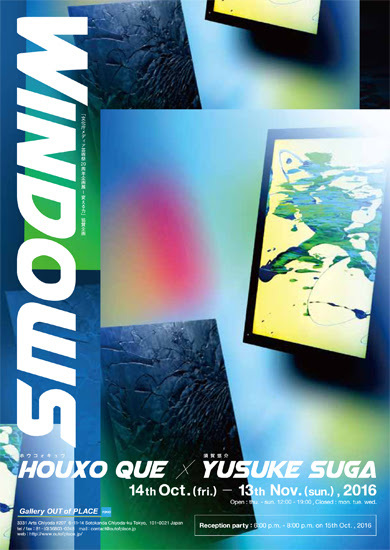 Gallery OUT of PLACE TOKIO is pleased to announce the opening of our October to November exhibition, “Windows,” featuring the two artists, Houxo Que and Yusuke SUGA. Upon the release of Windows 1.01 in 1985, just as its title suggests, the Internet has no doubt functioned as a “window” into society. As its focus, the title for this exhibition has this concept in mind as well. Even in contemporary art, as the choices in mediums and techniques continue to expand, it is not surprising that the Internet has come to be held as a motif in artistic expression. For example, Houxo Que directly applies paint on to monitor displays as a “window” exposing the distance between this world and that world. SUGA, on the other hand, intentionally sculpts displays out of wood as a powerful reminder to viewers that a “window” is in actuality, just an object.For this exhibition, we are pleased to invite you to view the completely different approaches to the concept of a “window” by two artists as they come face to face in a single space. Open : thu. – sun. 12:00 – 19:00 *Closed : mon. tue. wed. The artist will be present. Free admission.